These records were able to contain up to 15 minutes of recording on each side. Unlike the Columbia LP long playing 33 1/3 records introduced in 1948, the groove size was not a "microgroove" but was the same size as for the 78 RPM disc. However, grooves were somewhat closer together than conventional 78s 2. Most of these records were pressed on a new composition which Victor called "Vitrolac" which Victor considered superior to the standard shellac material used in 78 RPM discs of the era. However, over time, Vitrolac proved to wear more rapidly than conventional shellac records and they did not have a quieter surface. 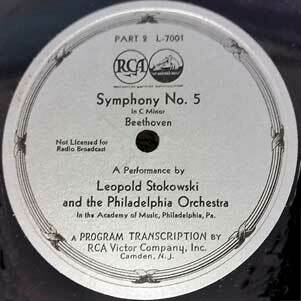 This first Victor Program Transcription release of Stokowski and the Philadelphia Orchestra performing the Beethoven Symphony no 5 was released on Victor L-7001, a two sided 12 inch (30 cm) disc recorded directly onto two 33 1/3 RPM matrices. 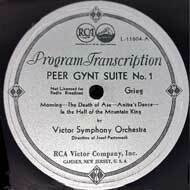 RCA Victor had been recording the Philadelphia Orchestra in their studios in Camden, New Jersey to save money, but this recording was made in the orchestra's home: the Academy of Music in Philadelphia which featured superior acoustics. Each of the two sides were first "takes" matrices LCVE 67543-1 and LCVE 67544-1: 17 and 14 minute sides each done in one take. These 33 1/3 recorded discs were not new in 1931. Bell Laboratories had developed electrical recording during the 1920s, including the Vitaphone system. Vitaphone was the first commercially successful sound track system synchronized to movies. Pioneering "talkies" such as The Jazz Singer starring Al Jolson in 1927 used the Vitaphone system. 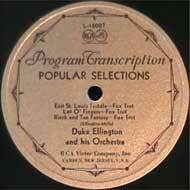 Vitaphone was introduced and commercialized in Hollywood by the Bell subsidiary Western Electric. The Vitaphone recording discs were engineered to contain the at least 11 minutes of sound, corresponding to the length of one reel of movie film as projected in that era. The Vitaphone disc was 16 inches (40 cm) recorded at 33 1/3 RPM, and played from the inside groove closest to the record label to the outside groove. 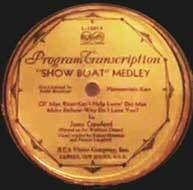 This same format disc was soon used for radio "program transcription discs" which allowed companies to create and syndicate radio programmes which they would distribute to radio stations to originate, locally, popular shows or to add to local radio content. 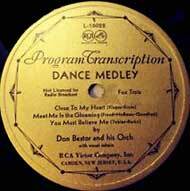 These recordings were 16 inches (40 cm) in diameter recorded at 33 1/3 RPM similar to the Vitaphone format. Such transcriptions continued to be used into the 1940s. 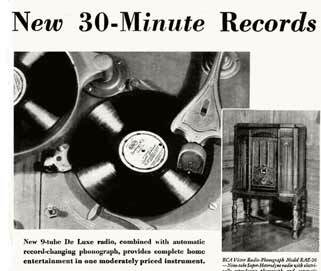 RCA Victor introduced several new record playing systems, usually integrating radios and automatic record changers which would play both 78 RPM discs and the new 33 1/3 RPM records. 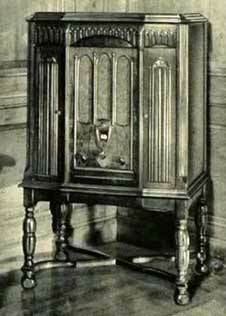 In 1931 the Radiola radio-phonography model RAE-26. The mechanism introduced by Victor for automatic play of either 78 RPM or 33 1/3 RPM Program Transcription	discs was heavy, even compared with the heavy pick-up designs of the 1930s. One advantage of the groove size of the 33 1/3 RPM Program Transcription disc was that, being the same as conventional 78 RPM discs, the same stylus could be used for both disc speeds. 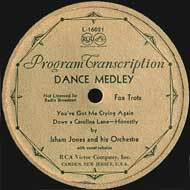 After the initial introduction of Program Transcription discs in September 1931, there were further fairly large releases in September, October 1932 and May through August 1933. 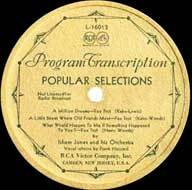 In November 1933 there was also released a series of albums of automatic record changer sequence to coincide with introductions of new automatic player equipment capable of playing both 78 RPM and 33 1/3 RPM discs. 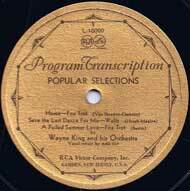 This commercial release taking place in the depths of the Great Depression, purchase of the special equipment needed to play these long-playing recordings was limited to a few affluent music lovers. 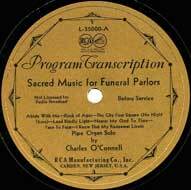 To expand sales, Victor even released long-play records which could be used in music halls, and a remarkable disc intended to be used in funeral establishments before and after a service ! 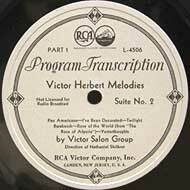 The 1931 Victor "Program Transcription" programme was even expanded to markets outside the US. 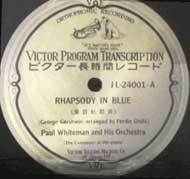 Striking examples include this pressing for the Japanese market of the Victor disk Victor L-24001, which was a 33 1/3 remastering of the 21 April 1927 recording of Gershwin's Rhapsody in Blue played by George Gershwin, piano and scored for Paul Whiteman and His Orchestra, who had commissioned the work. 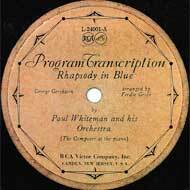 So ended RCA Victor's pioneering experiment with Program Transcription long playing records, which failed in part due to the technical problems described by Mr. Wallerstein, and also because this venture was undertaken during what were the most difficult years of the 'Great Depression'. Victor L-1000 side A matrix LBVE-69-165-1 contained BVE 22812-5 (Prelude) with CVE-27903-2 (Changing of the Guard) and CVE-37498-1 (Gypsy Dance). 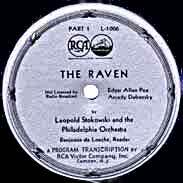 in 1933, Victor dubbed this recording of "The Raven" onto both a Victor 33 1/3 RPM 10 inch (25cm) Program Transcription disc L-1006 and onto two 78 RPM picture discs. 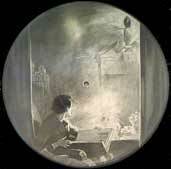 These picture disc were stamped on a transparent plastic material with an image of Edgar Allan Poe and with the words of Poe's poem (see image to right). 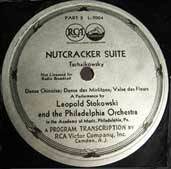 For the 1931 launch of its Program Transcription discs, Victor recorded Leopold Stokowski and the Philadelphia Orchestra in the Academy of Music directly onto a 12 inch (30 cm) 33 1/3 RPM disc, matrix LCVE 67543-1 side A, LCVE 67544-1 side B. These were 17 and 14 minute sides each done in one take. For Europe, HMV 42-1217 and 42-1218 are listed by the Discography of American Historical Recordings 3, but may not have been issued. 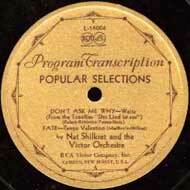 in August 1931 for the launch of its Program Transcription discs, Victor dubbed these recordings, originally made in 1929 onto 33 1/3 matrices. on April 9, 1932 this performance of Schoenberg's massive "Gurre-Lieder" was recorded live onto seven Victor 12 inch (30 cm) 33 1/3 RPM discs: L-11609 through L-11615 in Victor album LM-127 consisting of 13 sides of the Gurre-Lieder and one side of Stokowski's explanation of Gurre-Lieder themes (on side A of L-11609). 33 1/3 RPM matrices: LCSHQ-71699-1 through LCSHQ-71711-1 all first takes. sides were faded out and faded in on two separate cutting machines. 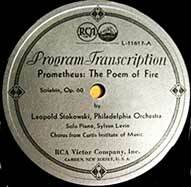 on March 19, 1932, Stokowski made the premiere recordings of two works by Alexader Scriabin: "Poem of Extasy" and "Poem of Fire" released in Victor Program Transcription album LM-125. recorded directly onto two 12 inch (30 cm) 33 1/3 RPM Victor discs L-11616 (Extasy), and L-11617 (Fire). L-11616 used 33 1/3 matrix LSCHQ-72019-1 side A, 33 1/3 matrix LSCHQ-72022-1 side B. L-11617 used 33 1/3 matrix LSCHQ-72025-1 side A, 33 1/3 matrix LSCHQ-72028-1 side B.
on April 16, 1932 this performance of Stokowski's "Symphonic Synthesis" of music from Tristan und Isolde was recorded in the Camden Church Studio in New Jersey directly onto discs L-11636 and L-11637 in Victor album LM-154. 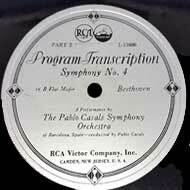 At this April 23, 1932 session, this Sibelius symphony was recorded on both a 78 RPM album M-160 and also directly onto two 12 inch (30 cm) 33 1/3 RPM Victor "Program Transcription" discs in album LM-160. For both speeds, two cutting machines were used allowing matrix sides fading out and in. The discs in album LM-160 were Victor L-11638, L-11639. L-11638 used 33 1/3 matrix LSCHQ-72078-1 side A, 33 1/3 matrix LSCHQ-72081-1 side B. L-11639 used 33 1/3 matrix LSCHQ-72084-1 side A, 33 1/3 matrix LSCHQ-72087-1 side B. 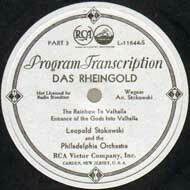 At these March 1933 sessions, this Rheingold "Symphonic Synthesis" was recorded on both a 78 RPM album M-179 and also directly onto two 12 inch (30 cm) 33 1/3 RPM Victor "Program Transcription" discs in album LM-179. For both speeds, two cutting machines were used allowing matrix sides fading out and in. The discs in album LM-179 were Victor L-11643, L-11644. L-11643 used 33 1/3 matrix LSC-75179-2 side A, 33 1/3 matrix LSC-75182-2 side B. L-11644 used 33 1/3 matrix LSC-75185-1 side A, with side B blank. Victor disc L-11645 side A LP matrix LCS-75661-3 dubbed 1927 matrices CVE 29052-6, CVE 29053-6, CVE 29054-6 and side B LP matrix LCS-75662-4 dubbed 1927 matrices CVE 29054-6, CVE 29055-6. Victor disc L-11646 side A LP matrix LCS-75663-2 dubbed 1927 matrices CVE 29056-7, CVE 29057-7. The final 33 1/3 side was blank. Victor L-11647 side A matrix LCS-76273-1 dubbed CVE 37483-2, CVE 37484-2 and side B matrix LCS-76274-1 dubbed CVE 37485-2, CVE 37486-1. Victor L-11648 side A matrix LCS-76275-2 dubbed CVE 37487-2, CVE 37488-2, and side B matrix LCS-76276-1 dubbed CVE 37489-1, CVE 37490-2. Victor L-11649 side A matrix LCS-76277-1 dubbed CVE 37491-1, CVE 37492-2 with the final 33 1/3 RPM side blank. Victor L-11650 33 1/3 matrix LCS-76268-2 dubbed CVE 34730-3 CVE 34731-4 and side two matrix LCS-76274-1 dubbed CVE CVE 34732-3, CVE 34733-3. Victor L-11651 matrix LCS-76270-1 dubbed 39340-2, CVE 39341-1 and side two matrix LCS-76271-1 dubbed CVE 39342-1, CVE 39343-1. Victor L-11652 33 1/3 matrix LCS-76272-1 dubbed CVE 39344-1, CVE 39345-1 with the final 33 1/3 side being blank. 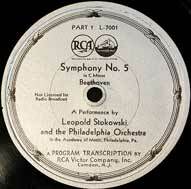 At recording sessions on March 4 and April 29, 1933, Stokowski and the Philadelphia Orchestra recorded the Brahms Symphony no 4 on five 78 RPM discs in album M-185. 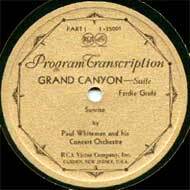 At the same time, during the March 4, 1933 session this recording was mastered onto three 33 1/3 RPM Program Transcription discs - not released. The 33 1/3 RPM Victor discs were assigned as L-11653 through L-11655 in album LM-185, not released. L-11653 used 33 1/3 matrix LSC-75164-1 side A, 33 1/3 matrix LSC-75166-2 side B. L-11654 used 33 1/3 matrix LSC-75170-1 side A, 33 1/3 matrix LSC-75173-1 side B. L-11655 used 33 1/3 matrix LSC-75176-2 side A, with side B blank. 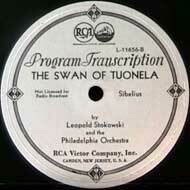 in 1933 this famous 1929 recording of the "Swan of Tuonela" was dubbed onto a Victor 33 1/3 RPM 12 inch (30 cm) Program Transcription disc Victor L-11656 coupled with the 1930 recording of Finlandia; but this disc was not released. The original 78 RPM recordings Victor 7380 (Swan) and Victor 7412 (Finlandia) continued to be sold. 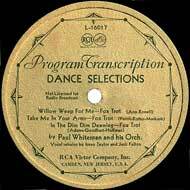 this 1929, 1930 recording of the Paris version of Tannhäuser - Overture and Venusberg Music was dubbed onto two Victor 33 1/3 RPM 12 inch (30 cm) Program Transcription discs Victor L-11669, L-11670 in 1933. Victor L-11669 33 1/3 side A matrix LCS-76754-1 dubbed CVE CVE 51876-6, CVE 51877-5A and side B matrix LSC-76755-1 dubbed CVE 51878-2, CVE 51879-4A. Victor L-11670 33 1/3 side A matrix LCS-76756-1 dubbed CVE 51880-1A and CVE 51875-2, with side B blank. 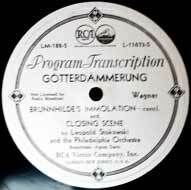 In these 1933 sessions, these excerpts from Die Götterdämmerung were recorded on both a 78 RPM album M-188 and also directly onto three 12 inch (30 cm) 33 1/3 RPM Victor Program Transcription discs in album LM-188. For both speeds, two cutting machines were used allowing matrix sides fading out and in. The discs in album LM-188 were Victor L-11671 through L-11673. L-11671 used 33 1/3 matrix LSC-75628-1 side A, 33 1/3 matrix LSC-75631-1 side B. L-11672 used 33 1/3 matrix LSC-75634-3 side A, 33 1/3 matrix LSC-75681-1 side B. L-11673 used 33 1/3 matrix LSC-75678-2 side A, with side B blank. In this recording session, excerpts from Die Walküre were recorded simultaneously on 78 RPM matrices and 33 1/3 Program Transcription matrices, with multiple cutting machines used so that sides could be faded from one matrix to the next without the orchestra stopping between takes. Neither the 78 RPM nor the 33 1/3 RPM recordings were released. 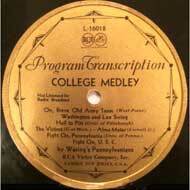 recorded directly onto two 33 1/3 Program Transcription discs L-11674, L-11675. matrices: L-11674 used 33 1/3 matrix LSC-78420-1 side A, 33 1/3 matrix LSC-78423-1 side B. L-11675 used 33 1/3 matrix LSC-78426-3 side A, 33 1/3 matrix LSC-78429-1 side B.
Stokowski arrangement of excerpts: consisted of Act 1 'Spring Song' of Sigmund, Act 3 Ride of the Valkyries, Act 3 Wotan's Farewell and Fire Music. 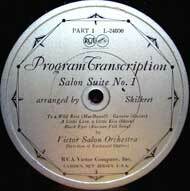 This session of the premiere recording of the Shostakovich Symphony no 1 was recorded simultaneously on 78 RPM matrices (for album M-192) and 33 1/3 Program Transcription matrices (for album LM-192), with multiple cutting machines used so that sides could be faded from one matrix to the next without the orchestra stopping between takes. 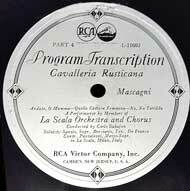 recorded directly onto three 33 1/3 Program Transcription discs L-11744 through L-11746. L-11744 used matrix LCS-78445-1 for side A, LCS-78454-1 for side B. L-11745 used matrix LCS-78448-1 for side A, LCS-78457-1 for side B. L-11746 used matrix LCS-78451-1 for side A, with side B blank. 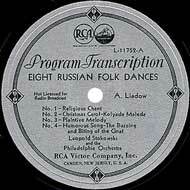 In this session, the Liadov works were recorded simultaneously on 78 RPM matrices for release on one 12 inch (30 cm) Victor Red Seal disc 8491 and one 10 inch (25 cm) disc 1681. Also on 33 1/3 Program Transcription matrix for Victor L-11752, with multiple cutting machines used so that sides could be faded from one matrix to the next without the orchestra stopping between takes. and 18 November and 5 December 1930 Studio 2, New York City First issued on Victor 10 inch (25 cm) 78 RPM discs 9903, 9904, 9905. 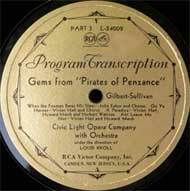 In 1931, these recordings were dubbed onto a Victor 33 1/3 RPM 10 inch (25 cm) long play "Program Transcription" disc Victor L-4506. 4, 5 July 1929 Olympia Theater, Barcelona, Spain First issued on 78 RPM discs by HMV in Europe on D 1725, D 1726, D 1727 and D 1728. 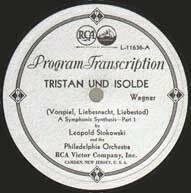 In 1931, this recording was dubbed onto a double-sided Victor 33 1/3 RPM 12 inch (30 cm) long play "Program Transcription" disc Victor L-11600. 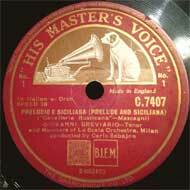 and 17, 31 January, 17, 18, 20, 22 March, 12 April 1930 La Scala, Milan 1930 HMV recordings were first issued on nine 78 RPM 12 inch (30 cm) HMV Gramophone discs C 1973 - C 1981 and also HMV C 7407 - C 7485. 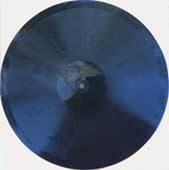 It was issued by Victor in the US on nine 78 RPM 12 inch (30 cm) Red Seal discs in Musical Masterpiece album M-98. 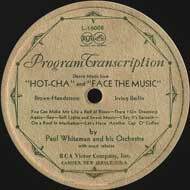 In 1931, these recordings were dubbed onto three double-sided Victor 33 1/3 RPM 12 inch (30 cm) long play "Program Transcription" discs Victor L-11601, L-11602 and L-11603. and 8 June 1928 Queen's Hall, London The Pasternack Victor recording was first issued on 78 RPM Victor 12 inch (30 cm) 35793, and Victor 10 inch (25 cm) 20245. 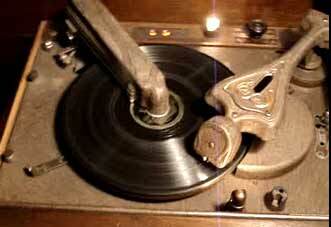 The Goossens HMV recording was first issued on 78 RPM HMV discs 5-0969, 5-0970, 5-0971, 5-0987. 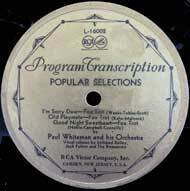 In 1931, these recordings were dubbed onto a double-sided Victor 33 1/3 RPM 12 inch (30 cm) long play "Program Transcription" disc Victor L-11604, a double-sided disc. 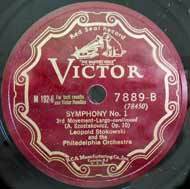 Victor L-11659 - L-11662 Beethoven: Symphony no 3 in E-flat major, Opus 55 "Eroica"
23 November 1931, Chicago, Webster Hotel A single-sided 10 inch (25 cm) disc. 1 December 1931, Chicago, NBC Merchandise Mart Studio D A single-sided 10 inch (25 cm) disc. 22 December 1931, Studio 1, New York City A single-sided 10 inch (25 cm) disc. 3 February 1932, Studio 1, New York City A single-sided 10 inch (25 cm) disc. 9 February 1932, Studio 1, New York City A single-sided 10 inch (25 cm) disc. 2 March 1932, Studio 1, New York City A single-sided 10 inch (25 cm) disc. Victor L-16013 Popular Selections - A Million Dreams, A Little Street Where Friends Meet, What Would Happen To Me If Something Happened To You ? 13 October 1932, Camden Church Studio 1, Camden, New Jersey A single-sided 10 inch (25 cm) disc. 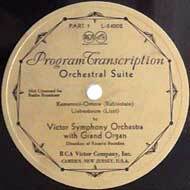 26 October 1932, Paramount Theatre organ studio, New York City A single-sided 10 inch (25 cm) disc. 24 November 1932, Studio 1, New York City A single-sided 10 inch (25 cm) disc. 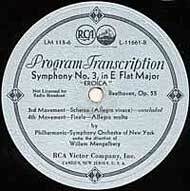 11 November 1932, Studio 1, New York City A single-sided 10 inch (25 cm) disc. 9 May 1932, Studio 1, New York City A single-sided 10 inch (25 cm) disc. 14 February 1933, Studio 2, New York City A single-sided 10 inch (25 cm) disc. 21 May 1931, Studio 2, New York City A 10 inch (25 cm) double-sided disc. 21 April 1927 Liederkranz Hall, New York City A 10 inch (25 cm) double-sided disc. First issued on 78 RPM Victor 35822, matrices CVE-30173-8 and CVE-30174-6 recorded 21 April 1927. 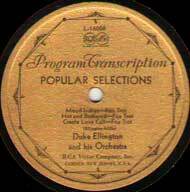 In 1931 these recordings were dubbed onto Victor 33 1/3 RPM 12 inch (30 cm) single sided long play "Program Transcription" disc Victor L-24001. 9 May 1927 Camden Church Studio, Camden, New Jersey, 7 May 1926 and 1 July 1926 New York City A 10 inch (25 cm) double-sided disc. 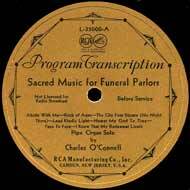 4 March 1932, Camden Church Studio number 2, Camden, New Jersey A double-sided 12 inch (30 cm) disc of background music for 'funeral parlors' played by Charles O'Connell, Victor recording supervisor for Stokowski and others. 2 page 3. Victor Company Introduces New 30 Minute Record Austin Daily Record. Austin, Texas. November 28, 1931. 4 Wallerstein, Edward. The Development of the LP. High Fidelity magazine. April 1976 volume 26 number 4.